Although the book has a rather formulaic beginning –beer bashes, restrictive parents, insecure teens confronting questions of popularity and acceptance – teen readers may well identify with Miriam and Deanna precisely because of these opening salvos. Children of immigrant parents may feel a particular affinity when Miriam announces, “I don’t want to look like I’m Egyptian. I don’t want to walk like one or talk like one or be one. I just want to be what I am. American.” But as soon as the girls get off the plane in Cairo, the story picks up drama, surprise, Egyptian news and culture – and even starry-eyed teen love. There are encounters with young Egyptians making choices about participating in demonstrations to oust then-President Hosni Mubarak, discussions about the wisdom of American teens showing up at those protests in Tahrir Square and frightening consequences when Deanna actually does. Miriam is forced to grow up even more when she accompanies her grandmother through a medical emergency. 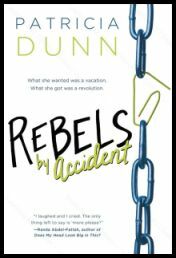 As a coming of age novel, Rebel by Accident will keep young readers turning the page but also raise challenging topics that can prompt discussion, from civic engagement to world events to a more nuanced understanding of cultural appreciation and parental guidance. Recommended.